Forum Index > Welcome to the Forum! > Welcome - and Helpful Hints! This is to help you all find your way around! 1. Click on Browse at the bottom of your post and choose your picture from your desktop - click OK. Pictures need to be in jpg format to appear in your post - other formats will stay as links. 2. Your attachment will appear in your post as a link only. 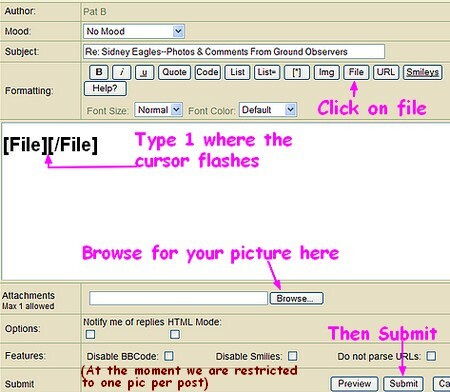 However, if you would like the actual picture to appear in the body of your post go to step 3. 3. Either type the following without spaces: [ file ] 1[ /file ] or put your cursor where you want the picture to be and click the File button in the formatting area (where the button for bold is) and put a 1 between the two tags. Your first attachment will now appear in the body of the post. 1. Choose the picture you wish to attach and right click on it - select 'Properties' from the bottom of the list! Highlight and copy the url! 2. Return to your post. OR Click on the img button at the top of your reply screen - you will find the cursor there waiting for you to paste the address! Move your cursor outside of the img tags before typing again! Clicking on the media gallery picture twice will give you a bigger version! Obviously you will not leave a gap in the brackets for real! Type it in without the gap after the bracket!! 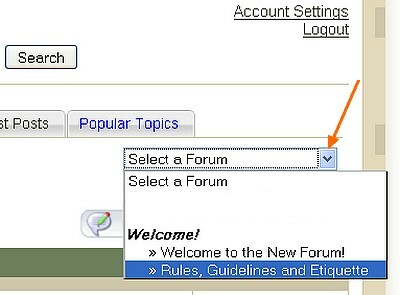 As you let your cursor move over the forum index - each entry will go GREY *! So how do you open the Topic - or get the last post?? If you want to open the post in a new window - right click on the 'page' at the top left of each post!! At the lower right corner of every post is an 'UP Arrow' to get you back to the top - where you can click on "Forum Index"
Use the drop down menu on the upper right. Many of us like to be able to see the posts we are replying to while replying! To get this feature, go to User Preferences from the right hand menu! Click 'Yes' for Show Topic Review! You can also use a bookmark to get back to the last post you read - simply click the star at the top of that post - and your bookmark will bring you back - where you can cancel the mark by clicking on the star again! Then the bookmark is clear - and you can do this again at the next post you want to get back to! This can be done in many forums at a time! All times are EDT. The time is now 03:53 PM.